Escape to an array of beautifully appointed guestrooms stretching from the pristine white sand beach to the lush green jungles of the Riviera Maya. 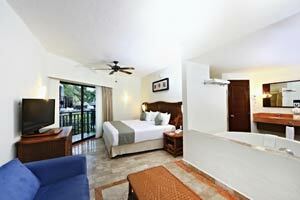 Four distinct Resort Zones provide you with a custom Riveria Maya all inclusive vacation experience. Kids can cool off at our fun-filled water park featuring splash areas and 17 slides, while parents relax poolside in the warm Caribbean sun of Playa del Carmen. The professionally supervised Kids Club offers a wide range of fun activities like a playground, crafts, TV, movies, sports and eco activities for children ages 4-12. Take in the tropical surroundings of the Riviera Maya at Sandos Caracol Eco Resort with a trek through the jungle, a romantic river ride or a swim in a natural cenote. Experience a fun-filled vacation with family or friends in our relaxing Standard rooms, situated in villa-style buildings along the resort’s winding pathways. 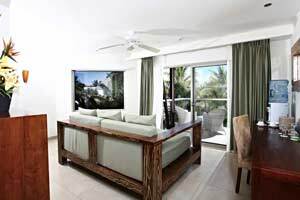 Each of these rooms features a private balcony or terrace and plenty of space to complete your Sandos all inclusive experience here in Playa del Carmen. 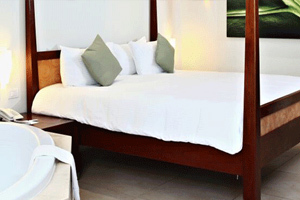 You’ll love the added perks of our Deluxe rooms! 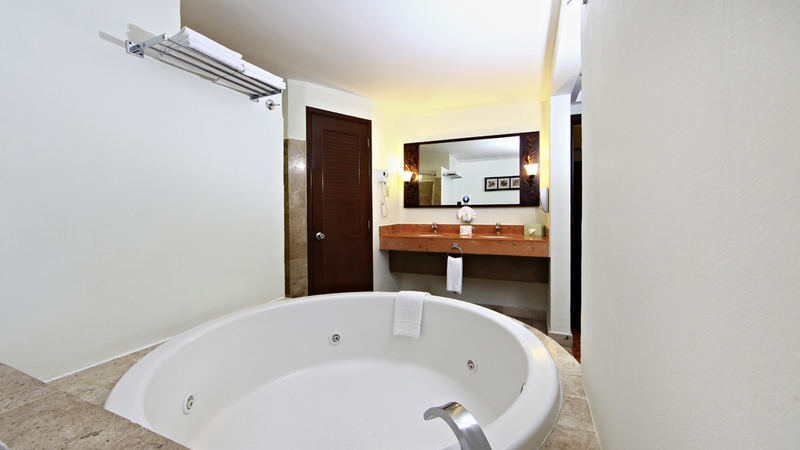 In addition to the spaciousness and charm that come in every guestroom, you can also relax in the comfortable living area and enjoy an evening in the in-room Jacuzzi tub – the perfect way to rest at our Playa del Carmen eco resort. 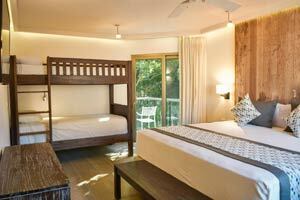 Our new Signature Eco Collection offer completely renovated rooms inside the family section. 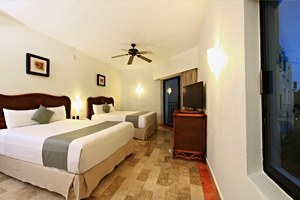 Picture yourself soaking in a Jacuzzi tub on your balcony while overlooking views of the gardens, pool or jungle in beautiful Playa del Carmen, Mexico. 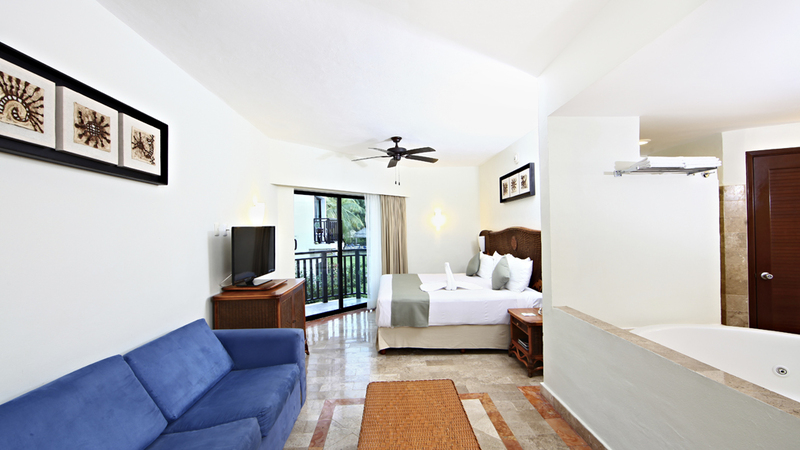 Each of our spacious Junior Suites also comes complete with an integrated living area and a sofa bed to add comfort to your upcoming all inclusive vacation in paradise. Set on the bottom of the hill in the secluded and historic original area of the hotel with amazing views of the bustling marina. 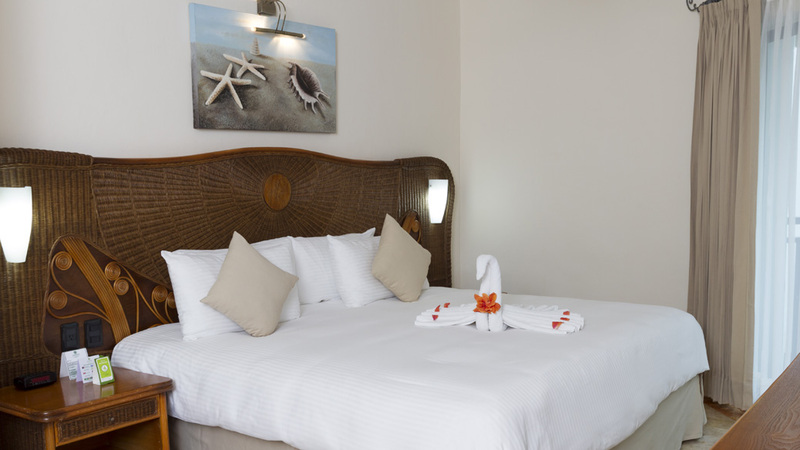 The Casita Suites have a bedroom equipped with one King bed and a separate living area with a sofa bed, sleeping up to 3 adults and 1 child or 2 adults and 2 children. 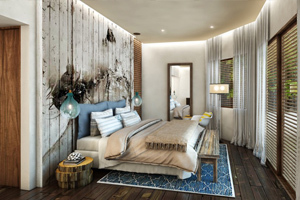 These newly renovated guestrooms feature sleek eco-inspired style along with extra space and a sofa bed for added comfort throughout your Playa del Carmen all inclusive vacation. Soak in your in-room hydromassage tub after a day on the beach, and enjoy upgraded amenities like in-room WiFi and cozy bathrobes and slippers. The Select Club Adults Only section sits in a private area of the resort for ages 18 and up, tucked away in a quiet jungle area for the perfect adult vacation in paradise. An adults only pool, jacuzzi and tanning area allow for quiet relaxation during your adult vacation, while the poolside La Jungla serves delicious daytime meals. The Select Club Adults Only section sits in a private area of the resort for ages 18 and up, with guestrooms tucked away in a quiet jungle area. Private concierge, a premium bar, hammocks and loungers are just a few of the luxuries at the Select Club exclusive Club House and beach area. Just steps away from the exclusive Select Club Adults Only pool area and a 5-minute walk from the beach, these serene guestrooms are immersed in a tranquil setting. Find everything you need for a private and romantic getaway with a variety of upgraded amenities during the perfect adult vacation. Our Adults Only Deluxe rooms feature an indoor Jacuzzi and a large bathroom, along with a spacious integrated living area. The secluded ambiance of our Select Club Adults Only section is perfect for added privacy and romance so you can spend in your adult vacation in style and comfort. Indulge in a variety of upgrades and comforts when staying in one of our beautiful Penthouses, outfitted with modern tropical style. 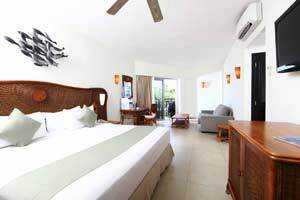 Each comes with a luxurious bathroom with shower, living and sleeping areas, and a balcony with a relaxing Jacuzzi for an unbelievable adult vacation experience. 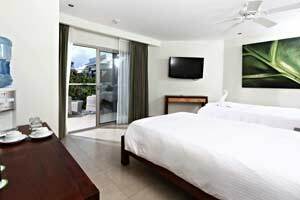 Step into chic modern style when choosing these contemporary rooms, situated in the most luxurious part of the resort just steps away from the Caribbean Sea and main pool. 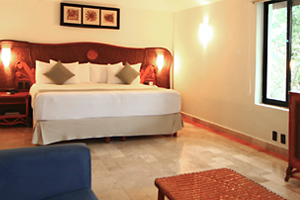 Each of these rooms comes with an elegant bathroom with shower, along with balcony or terrace and excellent services. These suites feature a charming location facing the main pool, just steps away from the turquoise tones of the Caribbean Sea. Enjoy a stay in our most luxurious rooms, with a spacious balcony or terrace, beautiful sleeping and living areas, and a wide variety of upgraded amenities. Our beautiful penthouse suites are filled with modern tropical details and everything you need for a luxury experience on Mexico’s Caribbean coast. Every penthouse has a relaxing in-room Jacuzzi, an integrated living area and a balcony, not to mention a wide variety of impressive amenities.